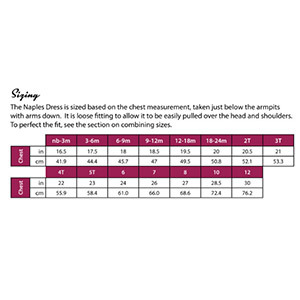 A perfect combination of ease and fancy, the Naples Dress features a subtle high-low empire bodice with crossover neckline. It pulls over the head and is fastened with either a bias bow or flowy tie. Sleeves can be sleeveless, circular butterfly sleeves, or mid-length or long bell sleeves. Skirt options include a swishy A-line or full gathered skirt in dress or tunic lengths. 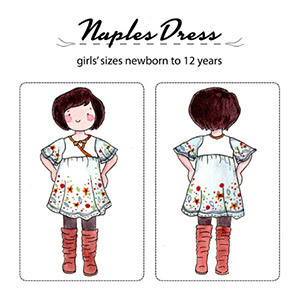 This pattern is available in sizes newborn to 12 years. Suggested fabrics are cotton lycra, cotton jersey, and specialty woven.